Our day started out fairly uneventful that is until this evening. We received a call from Andy Goretski saying he and a friend found an adult Bald Eagle in a leg hold trap on the Wisconsin River. 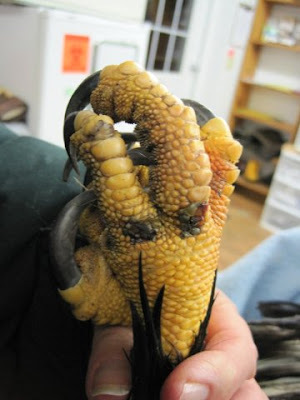 They were able to get the trap off the eagles leg. 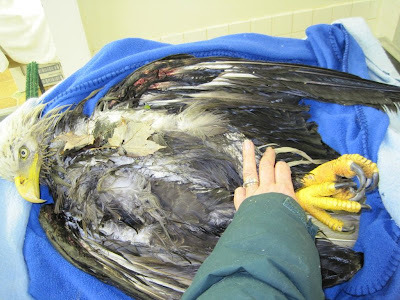 The eagle was past the point of fighting for his life. They laid him on the shore and called REGI. Don and I jumped in the truck and headed towards a half way point where we met up with the heroes of this story, the people that rescued the eagle from the Wisconsin River. 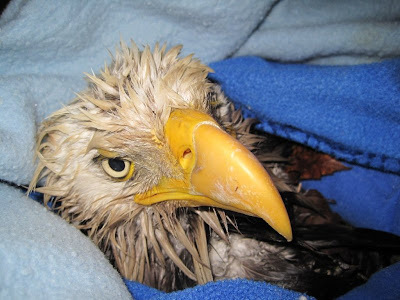 Once back at REGI we used a blow dryer to dry the eagles feathers. We tube fed him warmed emaciation diet to begin warming him from the inside. He stood briefly when we put him into the critical care box, but sadly the foot that was in the trap remained balled up and is discolored. We are hoping the circulation returns to the foot and leg soon, but it is a very serious situation. 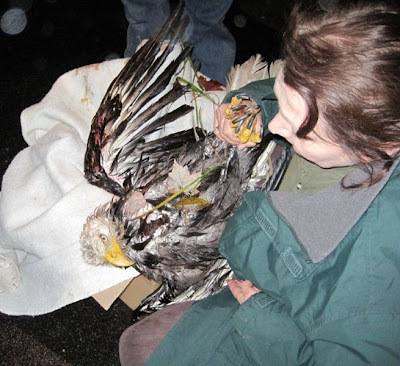 We have no idea how long the poor eagle was trapped at the site. Trappers are suppose to check their traps every 24 hours, but the trap involved in this incident was an illegal trap and therefore may not have been checked for days or longer. We do have a bit of good news today. 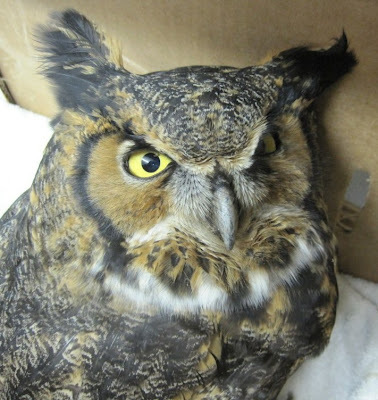 The Great-horned Owl that came in last night shot in the right wing is improving. She is still being tube fed and will be for at least another week, but her spirit is returning and her eyes are open. That is a good thing. 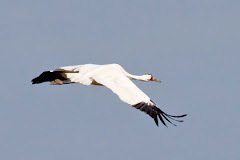 It will be a long night so I will sign off and hope for good news in the morning. 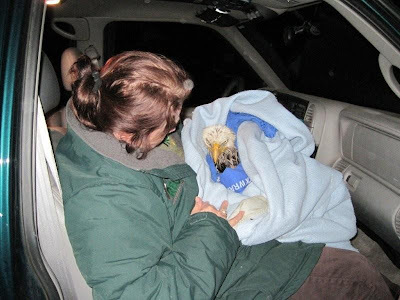 We are so grateful to the wonderful folks that rescued the Bald Eagle tonight and the Great-horned Owl last night. 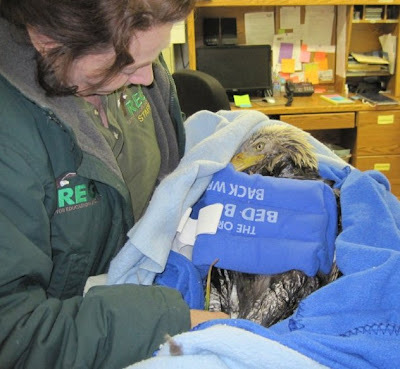 I always say that we can help injured wildlife but it is often the public that find them and rescue them. You are our heroes. Thank you so much.